Lycaon was a king of Arcadia in Greek mythology, but one punished by Zeus for his impiety. Today, Lycaon is often cited as being the first werewolf. Lycaon was the son of Pelasgus, one of the first mortals, who was either born of the soil, or was a son of Zeus and Niobe. Lycaon would succeed Pelasgus as the king of Pelasgia, as Arcadia was then known. This was the period in Greek mythology before the Great Flood when Cecrops was upon the throne of Athens, and Deucalion was king of Thessaly. King Lycaon was said to have had many wives, including the Naiad nymphs, Cyllene and Nonacris. These many wives would give birth to many sons for King Lycaon, although, whilst it was generally said that Lycaon was father to 50 sons, the names, and even the number, of sons does differ between sources. The sons of Lycaon though, would travel across the region founding many of the towns subsequently located in Arcadia. King Lycaon though also had a famous daughter, Callisto born to the Naiad nymph, Nonacris. Callisto was famously a companion of Artemis, who was then seduced by Zeus, and became pregnant with Arcas; Arcas is therefore a grandson of King Lycaon. The reasons for the downfall of Lycaon are normally split into two differing tales. One version of the myth of Lycaon sees the king as a good king and a relatively pious one. King Lycaon established the city of Lycosura, and named Mount Lycaeus after himself. Lycaon would also instigate the Lycaean Games and constructed a temple dedicated to Zeus. The piety of Lycaon though, manifested itself in one disturbing way, for as part of his worship of Zeus, Lycaon would sacrifice a child upon the altar of Zeus. The act of human sacrifice would see Zeus turn against Lycaon, hurling down his bolts of lightning, killing Lycaon and his sons. More commonly though, Lycaon and his sons were seen as being overly proud and impious. To test Lycaon and his sons, Zeus visited Pelasgia in the disguise of a labourer. As Zeus wandered through the kingdom, signs of the god’s divinity started to show through, and the populace started to worship the stranger. Lycaon decided to test the divinity of Zeus, and so the king and his sons arranged for a banquet, to which Zeus was invited. A child was killed, and parts of his body were roasted, and parts were boiled, with all parts served up as a meal for the god. The child butchered for the meal is variously named as Nyctimus, a son of Lycaon, Arcas, the grandson of Lycaon or else an unnamed Molossian child captive. A furious Zeus overturned the serving table, and the god had his vengeance upon Lycaon and his sons. 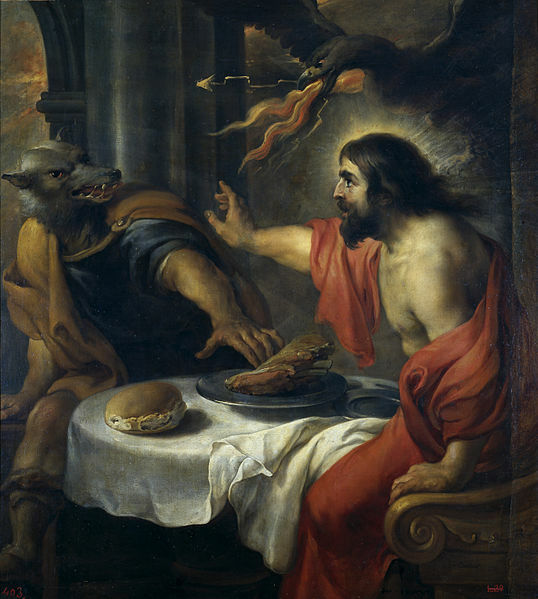 Now it was said that either Lycaon and his sons were all struck down by lightning bolts, or else it was the sons who were killed, whilst Lycaon fled from the palace and was transformed into a wolf by Zeus, hence the belief that Lycaon was the first werewolf. It was usually said that one son of Lycaon survived the attack of Zeus, this son being the youngest Nyctimus. With survival either due to the intervention of the goddess Gaia, or else it was Nyctimus who had been the sacrificial son, and as a result he was resurrected by the gods, in much the same way as Pelops would also be resurrected. In most cases it was Nyctimus who succeeded Lycaon as king, although occasional a generation was missed, and instead Arcas was made king instead. The successor of Lycaon ruled for but a short time in any case, for it was commonly said that the actions of Lycaon and his sons was the reason why Zeus sent the Deluge upon the earth, to destroy that generation of man.